Alex Thomure is a St. Louis native working out of Southern Illinois University Edwardsville’s ceramic studio. A non-traditional undergraduate student, Alex began his journey with clay through the local Kruger Pottery studio in St Louis during his middle school years, through high school, then onto Meramec Community College. After a few years at Meramec he transitioned to SIUE to complete his Bachelor of Fine Arts degree, where he is currently exploring wheel-thrown vessels and atmospheric firings including salt, soda, and wood. 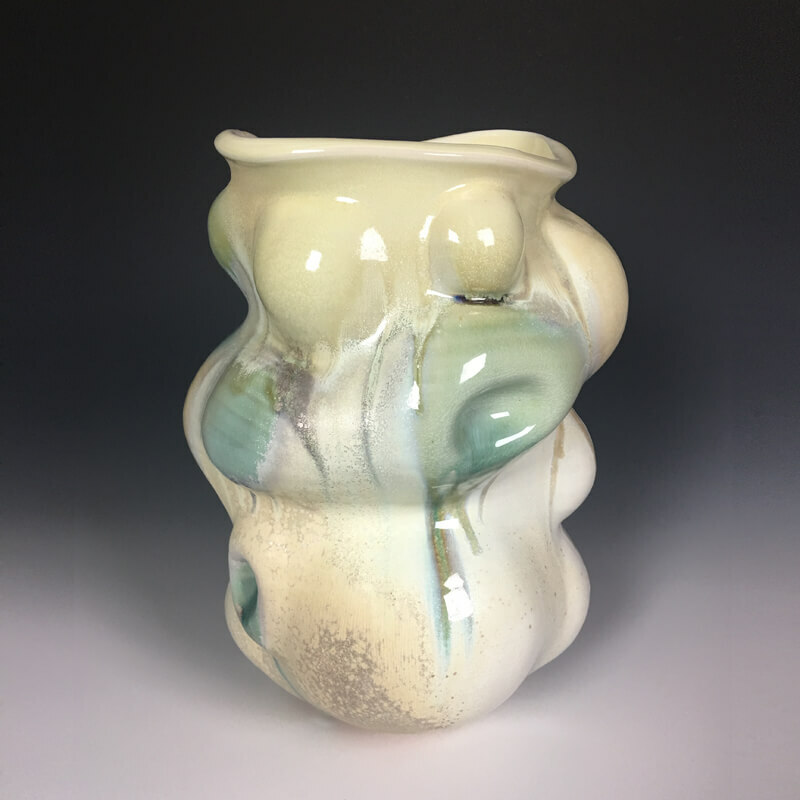 Alex’s work has been featured in exhibitions at Charlie Cummings Gallery, Dog’s Eye Gallery, and Companion Gallery, and has won multiple awards for his work in the Kansas City Clay Guild Tea Bowl National. As the potter’s wheel accelerates, the clay naturally desires to spiral outward, much like the centrifugal force of the universe. It could be said that the potter acts as gravity, centering and condensing the clay like gas and dust inside a nebula. This body of work fuses my fascination with astronomy and passion for pottery. The universe is a never ending supply of form and surface which I use as resources to create abstract renditions of the universe through investigations in form, glaze, and clay body. The porcelain I use is incredibly elastic, which allows me to alter and push forms to the limit. Sometimes these alterations push beyond limits, as the clay begins to rupture, revealing additional information about the form. This emphasizes the emptiness inside each vessel as it relates to the vastness of space. The porcelain clay body also results in brighter colors and works beautifully with flashing slips in atmospheric kilns. Atmospheric firing best compliments my forms; reactions from salt, soda, and wood ash emphasize the alterations and textures of the surface.